I did not buy the 73 Fastback at auction. › I did not buy the 73 Fastback at auction. Well I guess the medication is working. I went to an estate sale yesterday and this guy was somewhat of a car nut. They sold probably 35 vehicles at auction and the contents to several garages. The one car I was interested in was a red, 1973 F code automatic with air and decor group, side trim removed. Several people seemed interested in it during the pre auction review. One guy came all the way from Florida to view it and several others. When they got to the car I had decided $500 was my limit and it would just be a parts car. There were no rust holes in body or trunk but looked like cowl was leaking. It did run and drive and had a fiberglass NASA hood and the original flat hood. We it sold for $3,000 a Mexican guy bought and he said he was going to put a 390 in it, lol. A 1957 Ford tudor sedan sold for $7,500 with a 390 and 4 speed installed. There was a really rusty 65 Impala I think it even brought $3,500. 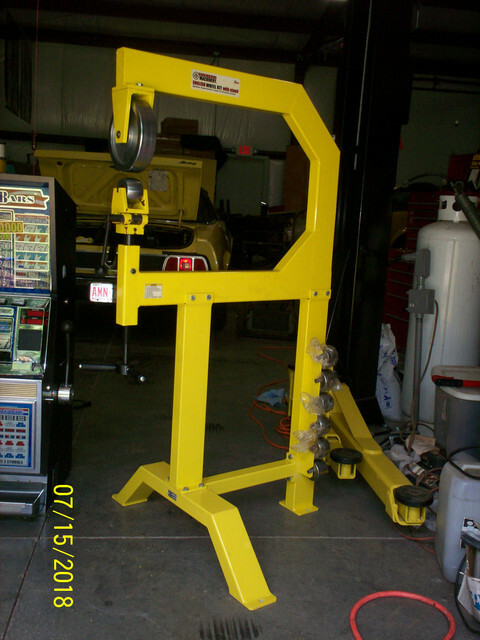 There was a brand new lathe in the shop one from Northern Hydraulics sells for $4,200 went for $1,500. He had brand new Lincoln, MIG, TIG and Plasma, new rotisserie and a used rotisserie, engine lifts and engine stands. 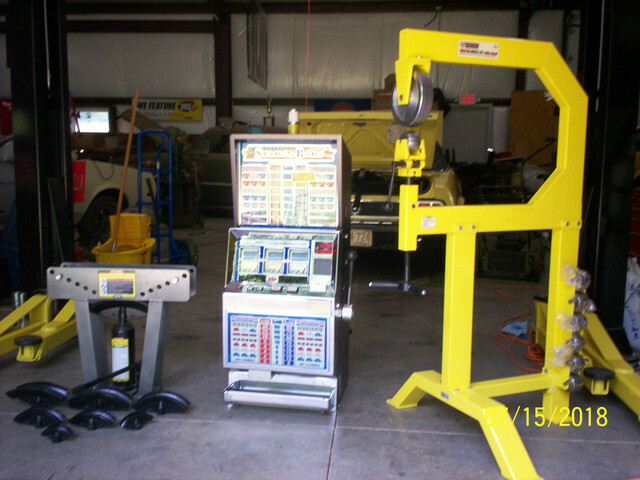 New gasoline powered portable Lincoln welder and generator went for $1,200. I did not watch the used rotisserie but new one went for $900. I bid on and got the brand new English wheel for about half price. 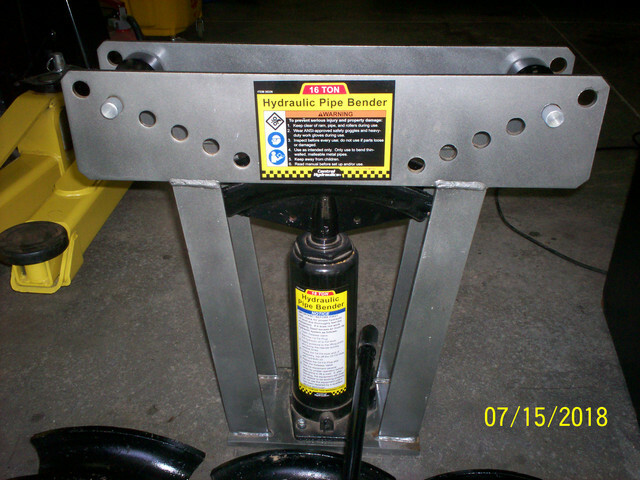 I also got tubing bender that I will use for roll bar construction for the verts. 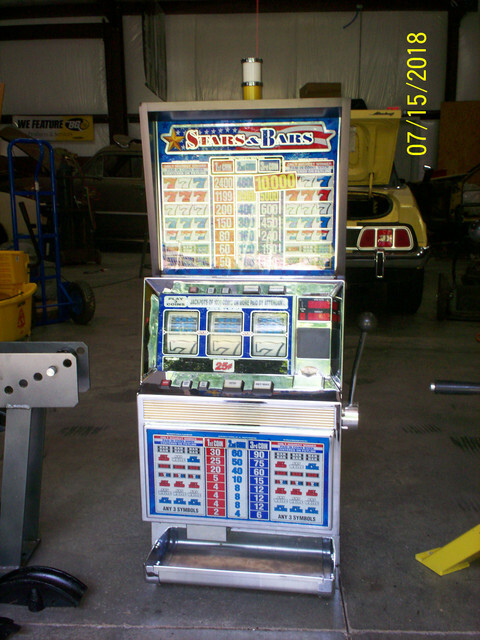 There were two slot machines in the garage and I got the Bally $.25 one cheap, darn thing is heavy and actually not legal to own here, lol. Also picked up miscellaneous reloading and ammo. Couple of loading presses went too high. There were hundreds of people and highway patrol came and started towing cars with tires on the pavement. A running driving motor home with no roof leaks went for $1,500. Most of his tools and equipment was brand new and not used at all. 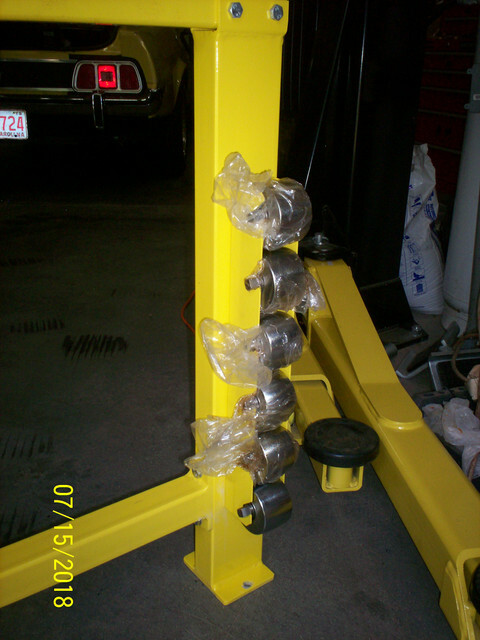 A two post lift went for too much they did not know original price and went for $1,400 had been used 6 times the daughter said. I almost bid on a 1996 F-150 that did not have a scratch in the bed and interior was perfect, no rust. Went for $1,300. There was a rear spoiler for 71 - 73 but was in a position that would put it at the end of the auction so I left it. There were complete 460 engines and just piles of parts. He had a full wood working shop with all Delta equipment that sold really low. I have all that and seldom use now. New Delta wood lathe with several boxes of chisels went for $150. 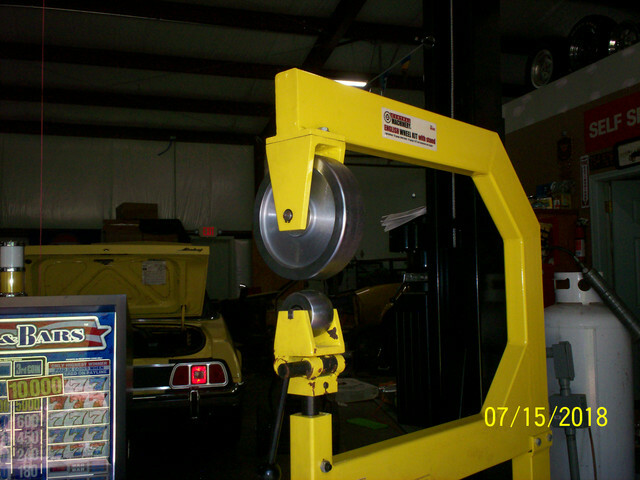 Delta band saw for $50.00 all new. There were tractor trailer box trucks full of black walnut, oak and cherry wood they sold for $500 each including the trailer. One guy found someone to pull his to his home and gave him the trailer after he unloaded the thousands of dollars worth of cherry wood. There was also several pieces of equipment, huge Deere track hoe, bull dozer and bucket loader. The auctioneer stated that he had two more auctions bigger than this coming up. They had online bidding also and went from 10:00 am and I left at 6:00 and still going. He was like some of us on here when he found a deal he would think I can fix that or I can make this and just bought way too much. He fell while at a funeral of a friend got hurt and never recovered at 72. There was a complete 1935 Chevy coupe that went for I believe $600. The listing is probably still on cl in the Asheville, NC area just search for 1973 mustang and it comes up. So more stuff for garage and man cave, lol. Pictures later. (07-15-2018, 08:49 AM)Carolina_Mountain_Mustangs Wrote: Well I guess the medication is working. I went to an estate sale yesterday and this guy was somewhat of a car nut. They sold probably 35 vehicles at auction and the contents to several garages. Here are some pictures of the equipment I got. 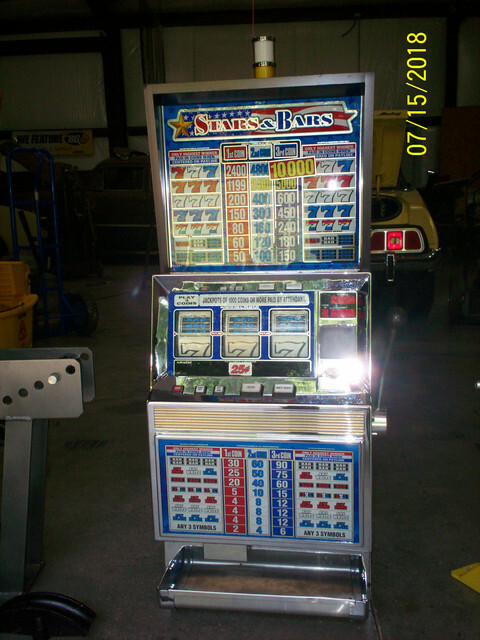 Has anyone on the forum ever worked on the slot machines? It is Model # S63M3XT10 Bally set up for quarters. Everything looks to be in place inside but I was told did not work. I have not plugged in to see. built July 1994 so not an old one. 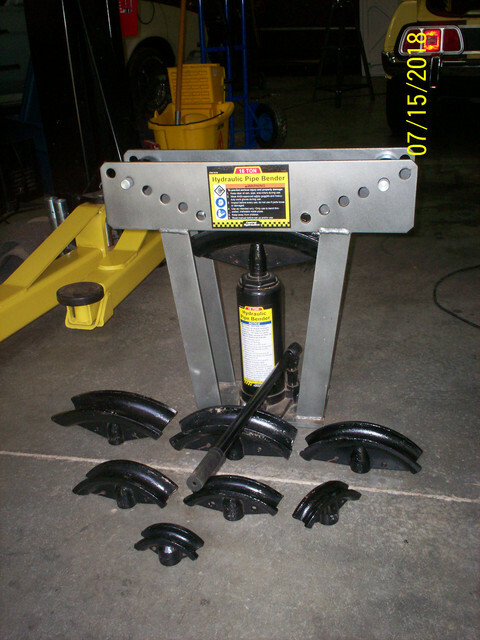 The bender will go from 1/2" to 3" in diameter and is 16 ton. The English wheel was never used never even had the wheels out of the plastic wrapper. Probably 80% of the equipment and tools there had never been used. 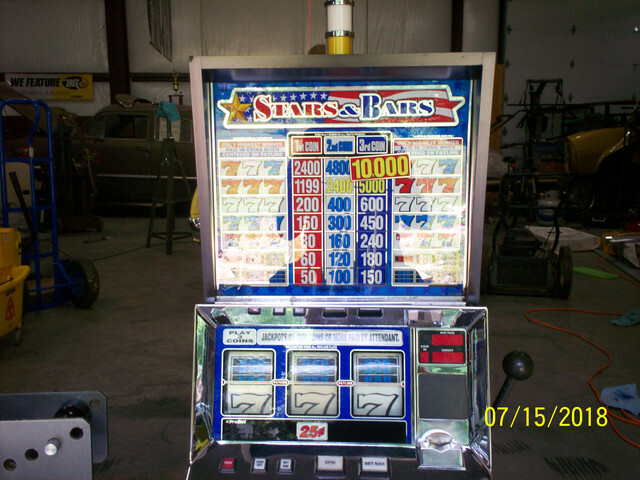 Slot machines from that era (and newer) are mostly electronic. Even the handle, while it feels mechanical, just contacts a switch that sets the reels in motion, which is why there is also a button you can push when you get too tired to pull the handle anymore. The electronics are pretty sophisticated, and basically a computer that controls everything, including the payouts. When in a casino they are also connected to the casino's computer system. I worked with a guy that took care of our two-way radios and communications and he had worked at a casino for several years repairing slots. He said that for the most part the electronics had to be sent back to Bally or IGT for repair/replacement and they had a stock of replacement boards on hand. I believe a lot of these have had key electronic parts removed and/or memories erased before being sold to the public. It shouldn't be that difficult for an electronic whiz to bypass the computer stuff with some switches and time-delay relays, or even a basic low-cost programmable logic controller to set the reels in motion and stop them. Doing payouts, and sensing coins inserted into the machine are a different problem, as they are also computer controlled and counted. Just the inserted coin mechanism is quite sophisticated so that slugs can be detected and discarded. Bottom line, casinos don't want you to be able to buy one of these and go into competition with them. (07-15-2018, 01:35 PM)Don C Wrote: Slot machines from that era (and newer) are mostly electronic. Even the handle, while it feels mechanical, just contacts a switch that sets the reels in motion, which is why there is also a button you can push when you get too tired to pull the handle anymore. The electronics are pretty sophisticated, and basically a computer that controls everything, including the payouts. When in a casino they are also connected to the casino's computer system. I got for garage decoration, lol. Just would like to have it work with the lights and such. I do think it is illegal to have a full operational one in N.C. will have to check. Thanks for info. It does not look like anything is missing even the thing that checks for slugs is there. Just does not have the base that the bulk of the coins goes into. Might plug in tomorrow and see if I can let the smoke out of some of the circuits.